We offer several support options to keep your large format printing solution up and running. Emailed technical updates from our support desk. *fair use policy and terms & conditions apply. Ad-hoc support without the premium price. 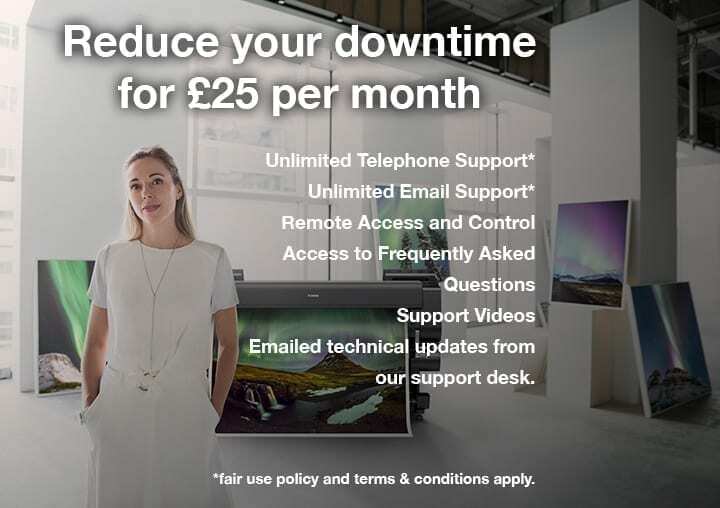 Are you experiencing issues with technology, but don't have one of our support contracts in place? No Problem! We offer ad-hoc support to get you over those annoying large format printer issues. Better still we don't charge a premium just because you don't have a contract with us! It’s only £99 per case. Simply call us on 0118 934 4426 or email sales@rgbuk.com for instant support or get your cover started. Our Training, Education and Knowledge (TEK) centre with a team of technical support engineers, trainers and consultants all with many years of experience in the world of digital imaging and large format printing has been setup to offer our customers one single point of call for their large format technical and training requirements. Our aim is to keep your equipment printing and offer you and your company the skills and knowledge to develop further. Printer out of warranty? Whether its a Canon or another manufacturer we can arrange for a trained and certified engineer to fix the problem. If you have an error code on your Canon imagePROGRAF printer take a look at our printer error code list to help diagnose your problem. We will additionally try and diagnose the problem over the telephone or via email / remote connection and then give you a fixed price for the job. Please contact us today. Sometimes the question you may have about the printer is not a sales related one. Please contact us for free advice. Whether you require one of our experienced team of installers to unbox and setup your printer on site or if you want us to connect in remotely and just setup the drivers and any additional software. We have many ways of making your new printer set up and configured corrected as smoothly as possible. Our new remote installation service aims to ensure all printers are configured correctly out of the box and that the printer is used to its maximum potential and value. Whether it is a media that needs profiling, a RIP that needs configuring or machines that need calibrating we can arrange for one of our colour management experts to get the best output from your device. If you need a spare part from your printer then get in touch. We can track down the correct part and if it is not in stock will get it in for you as quickly as possible. We can arrange for on-site training from one of our expert trainers. From the basics of loading media and changing consumables to the more advanced aspects of colour profiling and proofing our tailored training will ensure you obtain the knowledge and skills that you require so that your printer is used to its maximum value and you get even more from your large format printer. We will also be running some training workshops to help you get more from your printer and develop your large format print business. Sign up to our twitter, facebook and newsletter to keep up to date on future training. Enter your information below to find out more about our TEK service, or call us on 0118 934 4426 to speak to us directly.